Making cool stuff takes thought and thought takes time. All of my customers know that I want to make something for them that is special and will last. When I get given permission to do something properly I am in heaven. Combined Countries is an Aboriginal sports club in NSW. They have a Rugby League team that takes part in the Koori Knockout. I was asked to come up with a design for a mens ring to mark service from 2014 to 2018 for certain members. Their logo to the right was to be the base for the design. I am in Cairns, Queensland and they trusted me with this project without ever having met me. Pretty humbling! Dot art does not scale very well in the size of jewellery. I have had this discussion with many Aboriginal artists wanting to do jewellery versions of their art. The “2014” text in this logo will be lost in the size of a ring. The years to be used, 2014 and 2018, would have to be featured elsewhere in a larger size. 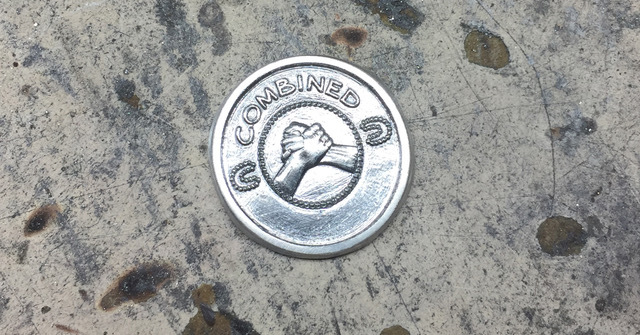 The dots would have to be larger and fewer and I would also need to modify the size of the font used for “Combined Countries” to get it to a size produceable as well as durable. I wrote an article about refining detail in a design in order for it to work in the small size of jewellery. You can read it here. The goal is to find the balance between taking detail out and changing sizes whilst still maintaining the intended shape. Often this has to be trial and error with metal as sketches and photos can be deceiving. Rough draft to confirm the viability of the sizes. To as quickly as possible determine what we were going to make and how much it would cost I had a go at creating the top feature. You can see that the proportions of the logo have been changed but it still retains its basic shape. This changed layout was approved. When I say as quickly as possible with quoting, I think I had spent well over 10 hours on this project before I had an indication of what we were going to make and how much it would cost. I do not see the point in quoting on a general idea and then forcing the piece to meet that quote. If the budget is very flexible then why bother to quote? This sort of time I would not have spent had I not known that they want to do multiples. Some designs are just not affordable for most people to create one of. Actually I never thought these rings would go ahead because the initial desired price/budget would have meant short cuts I do not take. - No rough quotes for you! I touched on design cost in the article about my son`s 21st birthday ring. You need to be able to spread the cost of a large design project over the creation of multiples for them to be affordable to most people. If you only need one peice then all that design cost has to be born in one piece often making it too expensive. When most people are used to buying mass produced machine made jewellery this can be something that they need to understand. Service years placed on the shoulders. 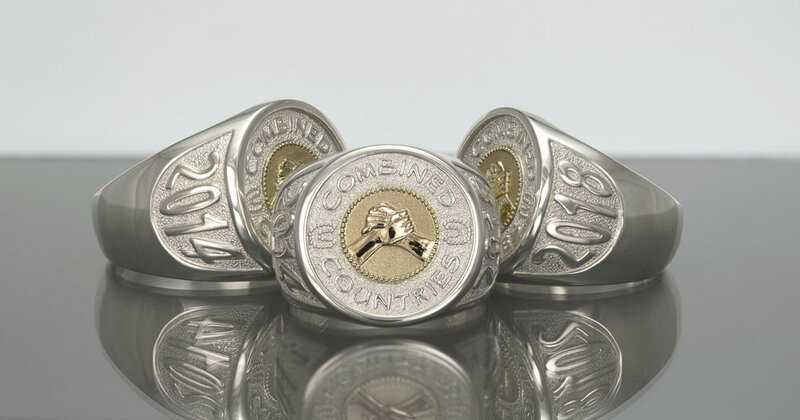 The idea of the rings was to mark the service of members from 2014 to 2018. I used the shoulders of the ring to do this. We had an idea of budget and for these heavy rings made properly, all gold was out of the question. I put it to the club to do the hand shake feature in yellow gold and the rest of the ring in Palladium Sterling silver. They agreed to the idea and the quote. I was given permission to make the first three rings. The head piece of the ring was a constant in each rings creation. They would all be as much as possible identical. However the finger size variations were so great that each band had to be individually laid out to size to accomodate the text and flow up to the top correctly. The three rings above vary in size from T to Z+3. To link each ring to its recipient their initials are engraved on the inside of the ring. Before making the rings size drafts were sent to NSW so that we could confirm the finger sizes. Rings like this do not resize well. A very sincere thank you to Combined Countries for allowing me to make these rings for them. The members of that club will know who did most of the work in organising the rings and put up with the crazy jeweller from up North. I am 100% certain he would not want me to mention his name so I will not but I thank him greatly for his patience.